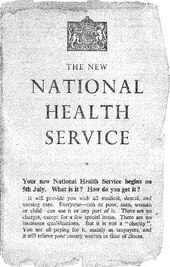 The National Health Service in England was created by the National Health Service Act 1946. Responsibility for the NHS in Wales was passed to the Secretary of State for Wales in 1969, leaving the Secretary of State for Social Services responsible for the NHS in England by itself. Hospital services: Fourteen regional hospital boards were created in England and Wales to administer the majority of hospital services. Beneath these were 400 hospital management committees which administered hospitals. Teaching hospitals had different arrangements and were organised under boards of governors. Primary care: GPs were independent contractors (that is, they were not salaried employees) and would be paid for each person on their list. Dentists, opticians and pharmacists also generally provided services as independent contractors. Executive councils were formed and administered contracts and payments to the contractor professions as well as maintaining lists of local practitioners and dealing with patients. Community services: Maternity and child welfare clinics, health visitors, midwives, health education, vaccination & immunisation and ambulance services together with environmental health services were the responsibility of local authorities. This was a continuation of the role local government had held under the Poor Laws. In 1948 across England and Wales there were 377 hospital management committees, and 36 teaching hospitals, each with its own board of governors. There were also 146 local health authorities, running health centres, ambulances services and other community services, and 140 executive councils, managing general practices, NHS dentistry, pharmacists and opticians. The new service instantly became Britain's third largest employer with around 364,000 staff across England and Wales. These included 9,000 full-time doctors, 19,000 professional and technical staff (including 2,800 physiotherapists, 1,600 laboratory technicians and 2,000 radiographers), 25,000 administrative and clerical staff, 149,000 nurses and midwives (23,000 of whom were part-time), and 128,000 ancillary staff (catering, laundry, cleaning and maintenance). By the beginning of the 1950s, spending on the NHS was exceeding expectations, leading in 1952 to the introduction of a one-shilling charge for prescriptions and a £1 charge for dental treatment; these were exceptions to the NHS being free at the point of use. Political concerns about spiralling NHS costs later receded in the wake of the 1956 Guillebaud Report, which praised the "responsible attitude among hospital authorities" towards the "efficient and economical" use of public funds. The 1950s saw the planning of hospital services, dealing in part with some of the gaps and duplications that existed across England and Wales. The period also saw growth in the number of medical staff and a more even distribution of them with the development of hospital outpatient services. By 1956, the NHS was stretched financially and doctors were disaffected, resulting in a Royal Commission on doctors' pay being set up in February 1957. The investigation and trial of alleged serial killer Dr John Bodkin Adams exposed some of the tensions in the system. Indeed, if he had been found guilty (for, in the eyes of doctors, accidentally killing a patient while providing treatment) and hanged, the whole NHS might have collapsed. The Mental Health Act 1959 also significantly altered legislation in respect of mental illness and reduced the grounds on which someone could be detained in a mental hospital. The Church House speech predicted that many of the large mental health institutions would close within ten years. Concern continued to grow about the structure of the NHS and weaknesses of the tripartite system. Powell agreed to the creation of a Royal Commission on doctors’ pay, which resulted in a statutory review body. Further development came in the form of the Charter of General Practice, negotiated between new Health Minister Kenneth Robinson and the BMA, that provided financial incentives for practice development. This resulted in the concept of the primary health care in better-housed and better-staffed practices, stimulating doctors to join together and the development of the modern group practice. In 1969, responsibility for the NHS in Wales was passed to the Secretary of State for Wales from the Secretary of State for Health who was thereafter just responsible for the NHS in England. After the publication by the British Medical Journal on 24 December 1949 of University of Cambridge consultant paediatrician Douglas Gairdner's landmark paper detailing the lack of medical benefit and the risks attached to non-therapeutic (routine) circumcision, the National Health Service took a decision[when?] that circumcision would not be performed unless there was a clear and present medical indication. Both the cost and the non-therapeutic, unnecessary, harmful nature of the surgical operation were taken into account. The NHS in England was reorganised in 1974 to bring together services provided by hospitals and services provided by local authorities under the umbrella of regional health authorities, with a further restructuring in 1982. The 1970s also saw the end of the economic optimism which had characterised the 1960s and increasing pressures coming to bear to reduce the amount of money spent on public services and to ensure increased efficiency for the money spent. The 1970's and 1980's saw issues with contaminated blood and blood products which was referred to later as the "worst treatment disaster in the history of the NHS". In the 1980s, Thatcherism represented a systematic, decisive rejection and reversal of the Post-war consensus, whereby the major political parties largely agreed on the central themes of Keynesianism, the welfare state, nationalised industry, public housing and close regulation of the economy. There was one major exception: the National Health Service, which was widely popular and had wide support inside the Conservative Party. Prime Minister Margaret Thatcher promised Britons in 1982, the NHS is "safe in our hands." In the 1980s modern management processes (General Management) were introduced in the NHS to replace the previous system of consensus management. This was outlined in the Griffiths Report of 1983. This recommended the appointment of general managers in the NHS with whom responsibility should lie. The report also recommended that clinicians be better involved in management. Financial pressures continued to place strain on the NHS. In 1987, an additional £101 million was provided by the government to the NHS. In 1988 the then Prime Minister, Margaret Thatcher, announced a review of the NHS. From this review and in 1989, two white papers Working for Patients and Caring for People were produced. These outlined the introduction of what was termed the "internal market", which was to shape the structure and organisation of health services for most of the next decade. In spite of intensive opposition from the BMA, who wanted a pilot study or the reforms in one region, the internal market was introduced. In 1990, the National Health Service & Community Care Act (in England) defined this "internal market", whereby Health Authorities ceased to run hospitals but "purchased" care from their own or other authorities' hospitals. Certain GPs became "fund holders" and were able to purchase care for their patients. The "providers" became NHS trusts, which encouraged competition but also increased local differences. Studies suggest that while the competition introduced in the "internal market" system resulted in shorter waiting times it also caused a reduction in the quality of care for patients. These innovations, especially the "fund holder" option, were condemned at the time by the Labour Party. Opposition to what was claimed to be a Conservative intention to privatise the NHS became a major feature of Labour's election campaigns. However, in his second term Blair pursued measures to strengthen the internal market as part of his plan to "modernise" the NHS. Driving these reforms were a number of factors including the rising costs of medical technology and medicines, the desire to increase standards and "patient choice", an ageing population, and a desire to contain government expenditure. Since the national health services in Wales, Scotland and Northern Ireland are not controlled by the UK government, these reforms have increased the differences between the national health services in different parts of the United Kingdom. (See NHS Wales and NHS Scotland for descriptions of their developments). Reforms included (amongst other actions) the laying down of detailed service standards, strict financial budgeting, revised job specifications, reintroduction of a modified form of fundholding – "practice-based commissioning", closure of surplus facilities and emphasis on rigorous clinical and corporate governance. In addition Modernising Medical Careers medical training had an unsuccessful restructuring which was so badly managed that the Secretary of State for Health was forced to apologise publicly. It was then revised but its flawed implementation left the NHS with significant medical staffing problems. Some new services were developed to help manage demand, including NHS Direct. A new emphasis was given to staff reforms, with the Agenda for Change agreement providing harmonised pay and career progression. These changes gave rise to controversy within the medical professions, the media and the public. The Blair Government, whilst leaving services free at point of use, encouraged outsourcing of medical services and support to the private sector. Under the Private Finance Initiative, an increasing number of hospitals were built (or rebuilt) by private sector consortia; hospitals may have both medical services (such as independent sector treatment centre (ISTC or "surgicentres"), and non-medical services (such as catering) provided under long-term contracts by the private sector. A study by a consultancy company which worked for the Department of Health showed that every £200 million spent on privately financed hospitals resulted in the loss of 1000 doctors and nurses. The first PFI hospitals contained some 28 per cent fewer beds than the ones they replaced. In 2005, surgicentres treated around three per cent of NHS patients (in England) having routine surgery. By 2008 this was expected to be around 10 per cent. NHS primary care trusts have been given the target of sourcing at least 15 per cent of primary care from the private or voluntary sectors over the medium term. As a corollary to these initiatives, the NHS was required to take on pro-active socially "directive" policies, for example, in respect of smoking and obesity. The NHS encountered significant problems with the information technology (IT) innovations accompanying the Blair reforms. The NHS's National Programme for IT (NPfIT), believed to be the largest IT project in the world, is running significantly behind schedule and above budget, with friction between the government and the programme contractors. Originally budgeted at £2.3 billion, present estimates are £20–30 billion and rising. There has also been criticism of a lack of patient information security. The ability to deliver integrated high quality services will require care professionals to use sensitive medical data. This must be controlled and in the NPfIT model it is, sometimes too tightly to allow the best care to be delivered. One concern is that GPs and hospital doctors have given the project a lukewarm reception, citing a lack of consultation and complexity. Key "front-end" parts of the programme include Choose and Book, intended to assist patient choice of location for treatment, which has missed numerous deadlines for going "live", substantially overrun its original budget, and is still (May 2006) available in only a few locations. The programme to computerise all NHS patient records is also experiencing great difficulties. Furthermore, there are unresolved financial and managerial issues on training NHS staff to introduce and maintain these systems once they are operative. Between 2004/5 and 2013/4 NHS output increased considerably. Hospital admissions increased by 32%, outpatient attendances by 17%, primary care consultations by 25% and community care activity by 14%. Hospital death rates reduced, especially in stroke. At the same time there was an increase in wages of 24% and an increase of 10% in the number of staff and increases in the use of equipment and supplies. As a whole NHS output increased by 47% and inputs by 31%, an increase in productivity of 12.86% during the period, or 1.37% per year. The return of a Conservative-led government in 2010 coincided with another deterioration in industrial relations. The introduction of further private sector involvement in the Health and Social Care Act 2012 provoked mass demonstrations led by health workers, and some NHS workers also participated in a national strike over pay restraint in 2014. 2016 also saw major industrial action by junior doctors, protesting at the imposition of a new contract aiming to extend weekend working. In 2019, doctors and MPs warned that the ongoing privatisation of certain NHS England cancer screening services would lead to patient harm. ^ Webster, Charles (1998). The National Health Service A Political History. OUP. p. 21. ISBN 0 19 289296 7. Retrieved 20 May 2015. ^ Saunders, Jack (2016). "Ideology and work in the Early NHS". People's History of the NHS. Cultural History of the NHS project. ^ Macmillan, Harold (2003). Peter Catterall, ed. The Macmillan Diaries, The Cabinet Years, 1950–1957. London: Macmillan. ^ GAIRDNER D (December 1949). "The fate of the foreskin, a study of circumcision". Br Med J. 2 (4642): 1433–7, illust. doi:10.1136/bmj.2.4642.1433. PMC 2051968. PMID 15408299. ^ Gollaher DL (2000). "The fabric of the foreskin". Circumcision: A History of the World's Most Controversial Surgery. Basic Books. pp. 114–117. ISBN 978-0465-04397-2. ^ "Contaminated Blood and Blood Products - Hansard". Hansard.parliament.uk. ^ Manfred Davidmann (1985). Reorganising the National Health Service: An Evaluation of the Griffiths Report (Second ed.). ISBN 978-0-85192-046-7. ^ "Prime Minister's Speeches – 1997 – Speech about the NHS". Pm.gov.gov.uk. Retrieved 13 March 2019. ^ "New generation surgery-centres to carry out thousands more NHS operations every year". Department of Health. 3 December 2002. Retrieved 15 September 2006. ^ George Monbiot (10 March 2002). "Private Affluence, Public Rip-Off". The Spectator. Retrieved 7 September 2006. ^ Hewitt, Patricia (2 July 2005). "Even Nye Bevan's NHS saw a role for the private sector". The Guardian. Retrieved 15 September 2006. ^ Wearden, Graeme (12 October 2004). "NHS IT project costs soar". ZDNet. Retrieved 15 September 2006. ^ Wearden, Graeme (15 November 2004). "NHS dismisses claim of IT security glitch". ZDNet. Retrieved 15 September 2006. ^ Collins, Tony (7 February 2005). "Is it too late for NHS national programme to win support of doctors for new systems?". Computer Weekly. Retrieved 15 September 2006. ^ Street, Andrew (December 2016). "The Financial crisis in the national health Service: insufficient funding will derail transformation plans". Radical Statistics. 115: 37–53. ^ editor, Denis Campbell Health policy (13 March 2019). "Halt privatisation of cancer screening or risk patient harm, MPs tell NHS England". Theguardian.com. Retrieved 13 March 2019. Abel-Smith, B. The Hospitals 1800–1948: A Study in Social Administration in England and Wales (Harvard U.P., 1964). Eckstein, H. Pressure Group Politics; The Case of the British Medical Association. (Stanford, CA: Stanford U.P., 1960). Eversley, J. The History of NHS Charges', Contemporary British History, 15, 2 (2001), pp. 53–75. Forsyth, G. Doctors and State Medicine: A Study of the British Health Service (London: Pitman Medical Publishing, 1966). Fox, D. Health Policies, Health Politics: The British and American Experience 1911–1965 (Princeton U.P., 1986). Fraser, D. The Evolution of the British Welfare State: A History of Social Policy Since the Industrial Revolution (London: Macmillan, 1973). Gemmill, P. Britain's Search for Health: The First Decade of the National Health Service (U. of Pennsylvania Press, 1960). Godber, G. The Health Service: Past, Present and Future (Athlone, 1975). Godber G (1988). "Forty Years of the NHS: Origins and Early Development". British Medical Journal. 297 (6640): 37–43. doi:10.1136/bmj.297.6640.37. PMC 1834188. PMID 3044487. Goodman, G. ed. The State of the Nation: The Political Legacy of Aneurin Bevan (Victor Gollancz, 1997). Goodman, N. Wilson Jameson: Architect of National Health (London: George Allen & Unwin, 1970). Grimes, S. The British National Health Service: State Intervention in the Medical Marketplace, 1911–1948 (New York: Garland, 1991). Ham, C. Health Policy in Britain: The Politics and Organisation of the National Health Service (2nd edn (Macmillan, 1985). Honigsbaum, F. Health, Happiness, and Security: The Creation of the National Health Service (Routledge, 1989). Jewkes, J. and S. Jewkes. The Genesis of the British National Health Service (2nd edn (Basil Blackwell, 1962). Klein, R. The New Politics of the National Health Service (3rd ed. 1995). Lindsey, A. Socialized Medicine in England and Wales: The National Health Service, 1948–1961 (U. of North Carolina Press, 1962). Powell, M. "Hospital Provision before the National Health Service: A Geographical Study of the 1945 Hospital Surveys', Social History of Medicine (1992), 5#3 pp. 483–504. Powell, M. "An Expanding Service: Municipal Acute Medicine in the 1930s", Twentieth Century History (1997), 8#3 pp. 334–57. Rivett, G. C. From Cradle to Grave, the history of the NHS 1948–1998. First Edition King's Fund 1998, and second edition 1948–2014 in two parts from website www.nhshistory.net. Watkin, B. 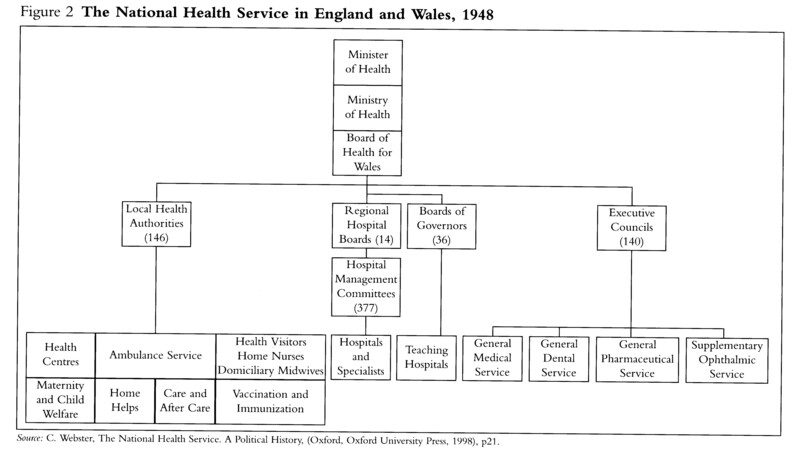 The National Health Service: The First Phase 1948–1974 and After (George Allen & Unwin, 1978).